Happy President's Day. This morning my daughter and I celebrated with a cup of coffee at Runsketeer Starbucks. She didn't have classes today because of the holiday. I'm off from work for the same reason. I always did like George and Abe. 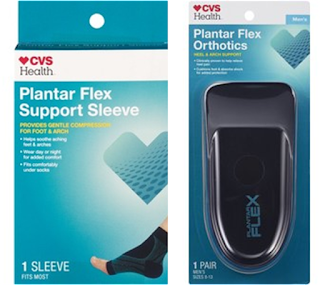 After Starbucks, I coerced my daughter into swinging by CVS so I could purchase a couple of items that will supposedly help reduce the pain of Plantar Fasciitis. I bought a Plantar Flex Support Sleeve and Plantar Flex Orthotics. When I looked them up on the CVS site I saw that "related items" included Crest white strips, contact lens cleaner and razor blade refills. This Fasciitis thing is pretty complex. Now I understand why my heel pain hasn't gone away quickly. White strips and support sleeves - a natural combination! I'm not sure if any of the stuff I got at CVS will help. Another great president, Teddy Roosevelt, said, "The best thing you can do is the right thing, the next best thing is the wrong thing, and the worst thing you can do is nothing." Action is better than inaction. Otherwise the Plantar Fasciitis wins. I dutifully placed the flex sleeve on my foot and put the supports in my shoes. I decided to forgo a run in favor of an upper body workout. Specifically, the Body Beast workout that TPP gave me last month. I put one of the DVDs into my laptop and as soon as I saw the Lou Ferrigno lookalike, I thought I might be out of my league. The warm-up was fine, but then they started doing push ups (push ups!) before the workout had even started. That did it for me. Instead of giving up on a workout, I went online and found a video of a woman trainer with less muscles than Lou Ferrigno. Her routine, using hand weights, took 10 minutes and felt more like a warm up than a real workout. I decided to look at a few other websites and found a set of exercises on "The Mindful Body" that looked reasonable. Since every person I talk to uses the term "mindful" these days, I figured I'd try it out. This routine was tougher than the ten minute warm up and took about 35 minutes to finish. I didn't work up a big sweat, but I know I hit every muscle group in my arms and shoulders. I'm curious to see how I feel tomorrow, as I haven't done a formal upper body workout since the London Olympics. While my arms will inevitably ache, I'm hoping my heel will feel a little better. If so, I'll take that trade-off. I forgot you competed in the London Olympics. It's a shame your water ballet never really took off. When you call it water ballet you diminish the athleticism and technical mastery we have as synchronized swimmers. And it wasn't the water ballet that took off, it was my monokini. Great treadmill run. This is not a typo.